Our troop has 32 tents currently in service. 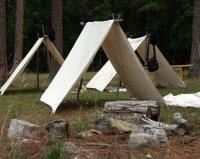 With 80 scouts in the troop, I've had lots of opportunity to see how tents wear out, break, or get damaged. Sometimes it is due to nature, other times it is neglect, and on rare occasion it is malicious. We need to remember that learning is our goal, not perfection. When a person is first learning to do something, he makes mistakes and equipment can take a beating. Teaching how to use equipment will save a lot of money, hassle, and frustration along the way. Teaching early and reminding often for the first few campouts will help the learning become habit. Mind the Door - When entering or leaving the tent, always open the zipper almost all the way, but not all the way. Opening just a crack and squeezing through is the biggest cause of tent damage I've seen. The stress on the zipper causes failure which is impractical to fix. Opening it all the way causes failure at the end of the zipper. No Clutter - The best way to keep a tent floor intact is to keep gear outside. Pulling gear in and out through the door is hard on the zipper and fabric. If the tent has a vestibule, that is fine for items you'll need during the night or first thing in the morning, such as boots and raincoat, but packs covered and kept outdoors are even better. Teaching this one behavior to scouts is probably the one best way to improve their tenting experience. Clean and Dry - After every use, turn the tent inside out to get everything out and wipe it clean. Set it up to dry completely and then pack it away. Store it in a dry area. This prevents mold and mildew. Complete Setup - Poles break because stress is not evenly distributed. Ensure all clips, sleeves, velcro, guy lines, and hooks are connected correctly, completely, and sturdily. Leaving a couple velcro straps unhooked during high wind places increased pressure on single spots on the poles instead of spreading it out and SNAP! A broken pole instantly makes a hole in the rainfly. Use a ground sheet - This protects the floor from the outside, mostly from the dirt. A ground sheet is just a cheap piece of painter's 6mil plastic. It comes in 8.5 foot side rolls, so it's simple to slice off a piece for a 2-, 3-, or 4-man tent's width. Have scouts request a new piece from the quartermaster when their piece is too ripped to continue. Be Consistent - Always leave the zipper in the lower-right corner of the door if it is a double zipper, or the lower-left if it is a single zipper. It makes it easier to find and ensures the door gets opened fully each time. 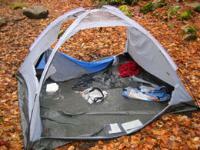 Store the Bag - When setting up, put the stake bag and pole bag inside the tent bag immediately. Bags blowing away is an all too common waste of gear. Store the bags inside the front-right corner of the tent - it's easy to get to and consistently easy to find. Mind the Wind - Set up your tent to protect it from wind. The rainfly on an A-frame style tent makes a great kite when the wind blows directly at an end. Instead, set up so a side is facing the wind. A dome-style tent with full rainfly to the ground can weather very strong winds and it doesn't matter much which way the wind hits it. Be sure to stake down all points and use the longer, higher guy lines at least on the upwind side for that bit of extra support to protect the poles. Seal It, Tape It - Using a seam sealer annually will help keep the rain out. Duct tape on both the inside and outside of holes and tears works well. Colored duct tape is available so the silver won't stand out so much. Higher quality tape stays much better and doesn't fall off leaving a gooey mess. No Fires - never, ever, ever have fire inside a tent. That's candles, stoves, matches, any flame. Know how to set up, use, and take down your tent before ever stepping into the wilds. Teach and practice the right way to use the tents before scouts go on their first campout. Friday night, in the dark, fighting the wind and rain, is not the time to learn how to set up the tents. Stakes don't usually break, but they get lost all the time. Painting a couple stripes of bright colored nail polish on each one makes them much more visible when breaking camp. If they have been driven into the ground, the only part you'll see is the head, so painting it bright is key. No matter how well you take care of your tent, an animal can destroy it easily. Having any food or smellables in your tent is inviting disaster, and much more than just a ruined tent. You should strive to create an environment in your troop where experienced scouts understand the value of maintaining their gear and passing that understanding on to newer scouts. Having a couple Instructors or Troop Guides or Eagle Scouts teach these ten tips to new scouts as soon as they join the troop will do wonders for your budget and quality of camping experience. If it's just the scoutmaster lecturing them about how expensive tents are and how they have to use their tent for seven years and blah, blah, blah, ... there's not nearly the impact. Do you have other tips about tent use to share? comment away. Thanks for the tips. They are really helpful. We had a practice sesssion on the "back yard" of the church property that sponsered our troops. We had a troop guide and older high ranking scouts that were experienced teach use about tent prep. We got hands on - set up and take down. We learned a lot. Hands on is the way to go. Put a SMALL safety pin over the zipper close to the end to keep inexperienced scouts from accidentally unzipping all the way. ALWAYS use a brass safety pin, they don't rust and can be left in place permanently. They can be found in the sewing section of most craft departments and stores. Look for the package that comes in a nice reclseable plastic box. They are usually similar in price to the packages that you destroy to get the pins out. That way you have them handy for temporary repairs of other equipment(split clothing seams, etc).